Explore how human activities alter the carbon cycle and cause atmospheric carbon dioxide to increase. 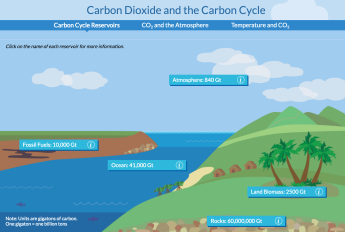 Learn about the reservoirs and flows of the carbon cycle and how human activities increase the amount of carbon dioxide in the air and ocean. This increased atmospheric carbon dioxide causes global warming. Two following interactives show how higher carbon dioxide levels cause global warming (Earth’s Energy Flows and Climate) and highlight climate change impacts and adaptation strategies for ecosystems and human communities (Impacts of Climate Change in the Pacific Region). For the interactive, visit PBS Learning Media.